My Wines of the Year enters its 21st year of continuous publication, since it began in 1997. Reflecting on a year of wine is always a pleasure, but choosing the winning wines a real challenge. 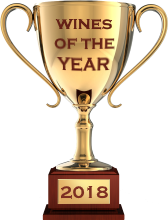 I’ve whittled thousands of wines down to the best I have tasted in nine categories, plus two extra categories: ‘Dud’ of the Year, and ‘Thing’ of the Year. As always, I invite wine-pages visitors to send in their Wines of the Year for publication. The ‘Dud’ can be the worst, or most disappointing wine, and please use ‘Thing’ as imaginatively as you like – it may or may not be wine related! See the lists from visitors to wine-pages here. 1985 remains my favourite Bordeaux vintage, and also ties in nicely with my ‘Thing’ of the year *. The Margaux was sublime, and all you could ask for in terms of perfume, balance and sheer deliciousness. Blank Canvas is one of my finds of 2018. The Lagneau proves that 2015 is a brilliant vintage in Beaujolais, while the Puklavec is just such a lovely example of Pinot Grigio’s ability to transcend the banal. Bellavista was an easy choice for my rosé of the year: I tasted many fine dry rosés, but the Bellavista is exceptional. The Château Guiraud has been in my cellar for 20 years, and though I am coming to the conclusion that I prefer Sauternes without too much age, this was in a perfect place. A visit to Deutz produced many favourites, but the 1995 of their deluxe cuvée pipped the 2002 for current drinking. The two Blandy’s Madeiras were tasted at the IWSC awards dinner (both took gold/trophy awards) and my god they are both brilliant, profound wines. My final wine choice is the ‘pet nat’ from Meinklang, a gently frothy, unflitered, off-dry wine that is a fine example of a natural winemaker getting it dead right. * And to my ‘Thing’ of the year: 2018 saw me win the title of International Wine Communicator of the Year, stage three completely sold out Festivals of Wine, attend an amazing Christmas lunch with 72 members of the wine-pages community, and my band reformed after 35 years, which has been a joy. It’s been a fantastic year with so many contenders, but I did also get married in August after a 33 year ‘engagement’ (hence 1985 featuring extensively in my cellar). I think I am duty-bound to vote for that! Click to read full tasting notes for Tom’s Wines of the Year. Oh, thanks Alex. It has been a fine year, so fingers crossed 2019 continues in the same vein! Congratulations on another successful year, Tom. It was a pleasure to see you again, albeit briefly, at the recent WIMPs. Best wishes on your marriage, and I’ve enjoyed listening to Restricted Code on the internet. Oh, well – cheers Hugh. Yes, it was great to spend a few minutes at least chatting at the lunch last week – ages since we last met, but hopefully won’t be so long until the next time :). Yes, playing with the band again is great fun – nice to be making music and nice that we all just gelled together as if the 35-year separation had never happened! Congratulations Tom on a memorable year and especially for getting married. It was good to meet you finally at WIMPS.